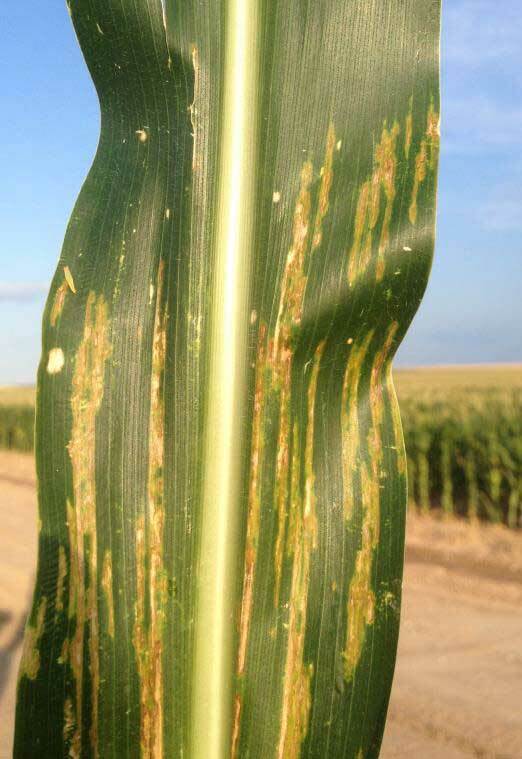 Last year we found a new foliar disease of corn, bacterial leaf streak, in a few fields in Texas Co. It was confirmed in 2 out of 10 fields in Texas Co, but not in other counties checked. The disease was minor compared to neighboring states such as Kansas and Colorado. Severity on affected leaves was only about 1 to 2% of leaf area and it was difficult to distinguish from immature lesions of gray leaf spot. The disease is caused by Xanthomonas vasicola, apparently a new pathogen in the U.S. I visited Texas Co. again in mid July 2017 to check on the status of bacterial leaf streak. The disease was present in 3 of 10 fields checked and was easier to identify as symptoms were more distinct than in 2016 (Figure 1). Some plants had about 5% of diseased foliage in the mid canopy at growth stages ranging from R1 (silking) to R2 (blister). This level of disease could become damaging if the disease were to continue to develop. For example, a similar level of gray leaf spot or southern rust at these early reproductive growth stages might justify a fungicide application depending on the price of corn. However, we do not know enough about the development of this disease over the season to predict final disease outcome. 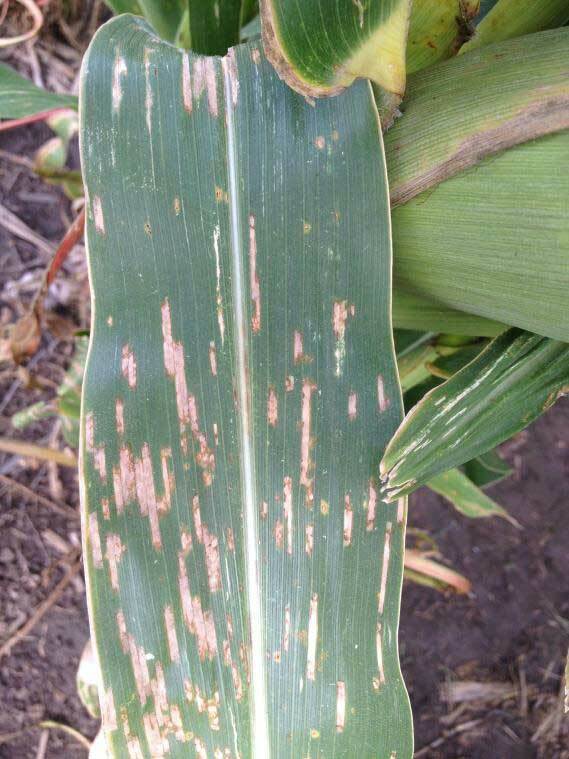 Seed pathologists at Iowa State University have learned that the disease is seedborne. Spread of the pathogen on seed is likely to contribute to long distance spread of the pathogen. It is also likely that minimum and no tillage production systems favor survival of the bacterium from year to year on stubble. While there are no spray treatments for bacterial leaf streak, be sure not to mistake bacterial leaf streak for gray leaf spot. Gray leaf spots have straight margins and lack yellow hallows around the spots (Figure 2). Conversely, bacterial leaf streak has wavy borders and are typically surrounded by a yellow halos. Because fungicides do not control bacterial diseases, application of fungicide for bacterial leaf streak is likely to be a wasted expense unless gray leaf spot or southern rust is also present.